Superstition comes to me easily. I can’t take all the credit, some of it was passed down by my Eastern European Mom who would be very proud of how successful she was in training me to look for “signs” everywhere, both good and bad. Unfortunately there were a few minor glitches that happened to me this week, but the fact that they happened right before Rosh Hashana raised every superstitious hair on my head. First it was a missing cookbook that I spent hours looking for over a period of a week or more. Then I misplaced my reading glasses which was problematic since I was trying to look through cookbooks, and then yesterday there was a third (they say bad things happen in threes) “incident.” I took my very large brisket outside to place in the back fridge, opened the garage, made room in the fridge, closed the fridge and the garage, and completely forgot about the brisket sitting on the ledge. It sat in the 95 degree heat for over 8 hours, cooking. I called my sister and she had the perfect response, she said “kapparah,” and added that she hopes that’s the worse thing that happens to me in the coming year. Amen. Then things turned around, I found my cookbook, Norm found my glasses, my friend Judy bought me the first in the series of that cookbook which made me realize that I had owned the second, and I made short ribs in place of brisket. My mood lifted, maybe the signs weren’t so bad after all. Today, I spent the day cooking a completely traditional meal that didn’t need much thought or creativity. It is pretty much a duplicate of my mother’s yontif meal which was always the same. Growing up there were two things that were predictable when it came to the holidays. What would be served for dinner and what you wore to Shul. There was an unspoken dress code that included delicate ankle socks , black patent leather Mary Jane’s, a new dress for the New Year, and hair neatly combed back out of my face with the help of a thin velvet hair band. Dinner was Gefilte fish, chopped liver, chicken soup with kreplach, garlic chicken with roast potatoes, pineapple kugel and apple cake for dessert. Predictability can be good, but clearly it doesn’t always work out as you hope. So as we head into the New Year, I hope that most of the signs I see are good ones, and as my mom always said, may the New Year be better, and no worse. Here is a family favorite to help sweeten the year. This looks delicious — and maybe Steve would like it (he doesn’t like mine which is from my grandmother). I’ll let you know! It’s not too sweet so add sugar if you want it really sweet. Let me know if you make it! I’d probably like it sweet — but that’s what Steve doesn’t like about my grandmother’s recipe — it has maple syrup AND dark corn syrup AND brown sugar! Wow, too sweet for me too! Great post Irene! Shana tova! I bet you’re enjoying having the kids in LA!!! 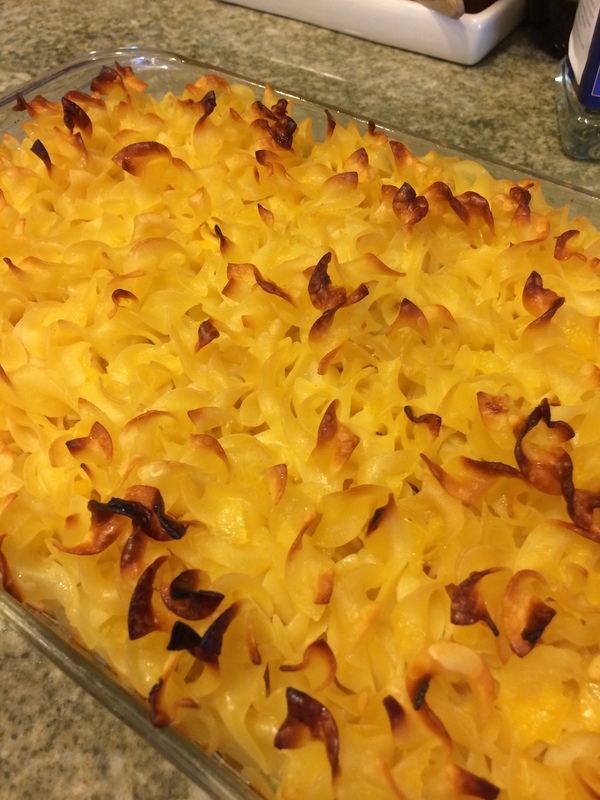 Speaking of, to show where my head is, I assumed that “Manya’s pineapple kugel” meant that a new generation likes the kugel, and that you were going to send us a photo of your granddaughter covered in it. Now I realize the Manya is the older Manya! Another good mix-up! Thanks Noga! Shana Tovah to you and the family. Yes, we do love it, I must admit. I don’t think we fed her the kugel because no teeth yet, but maybe next year!! Thanks for getting in touch! Gmar Tov. Loved the story although, as is sometimes the case, your mother and my mother are totally different women. We had dinner with the Shanes and she made a lokshen kugel and I told them that mommy put in pineapple. And then I see your post. Bashert? I am very busy coming up with the list of superstitions that Mommy had and will get them to you asap. Of course, beshert!!! Love you too!!! Shana Tovah, Saiger’s! Enjoy. And yes. That should be the worst but, Oy! An expensive loss!! Thanks Nancy!! I don’t think she had any but I sure did!!! Happy New Year Irene and family. I always look forward to your comments and recipes. Thanks so much Mollie!! Happy New Year to you too!!! Hope you and the family are all doing well. Thanks Elana! So nice to hear from you! Please send me the link to yours! Heard you made an amazing dinner!! !